At FS Construction Services, we get a chance to work on a wide range of different projects. We embrace the challenge each new client brings, whether it’s big or small or it takes us two days or two weeks to complete. But every now and then, we get a project that allows us to work with some of the most advanced and exciting equipment on the market. And lots of it too! 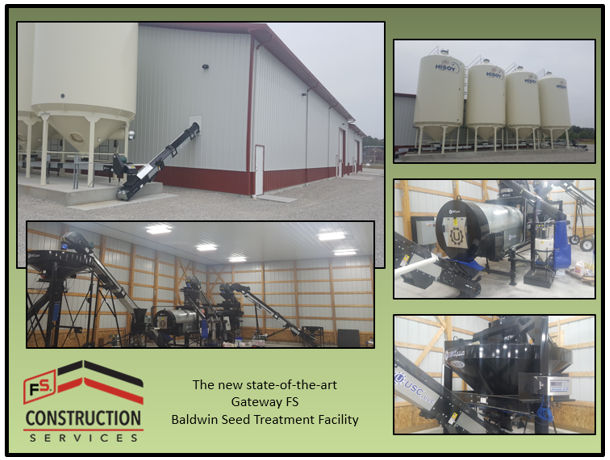 This past August, we fully outfitted the Baldwin Seed Treatment Facility with some top-of-the-line equipment. We constructed eight 3,000 unit bulk bins, a Tri-Flo Batch Hopper capable of treating 1,800 lbs. a minute, and an LPV-style seed treater from USC. Additionally, while FSCS Seed Treatment Specialist Justen Kempfer oversaw installation, he also provided on-site training of all the new equipment and was present for any questions our client had. With the addition of this new equipment, the Baldwin Seed Treatment Facility is now the most advanced and up-to-date facility in the area, able to treat and load a 240-unit tender in 6-11 minutes (depending on seed size), half the time it took before. They now have everything they need to accurately treat seeds to the specifications of each farmer. In fact, thanks to the automation capabilities of the new equipment, the facility can save and store individual farmers’ “recipes,” ensuring their seeds are able to receive the exact same treatment year in and year out. If you are looking for some new equipment for your one-of-a-kind operation, no matter the size, let Gateway FS Construction Services know. From grain drying to grain storage to grain handling and transfer, we have everything you need for successful seed treatment. You can give us a call at 866-551-3454, and let our specialists help you find exactly what you are looking for. We look forward to providing you the best customer service experience. Believe it or not, harvest season is already here. For many of our clients and many in our community this means weeks of high stress, little sleep, and hard work. At FS Construction Services we know a thing or two about working with a tight deadline. 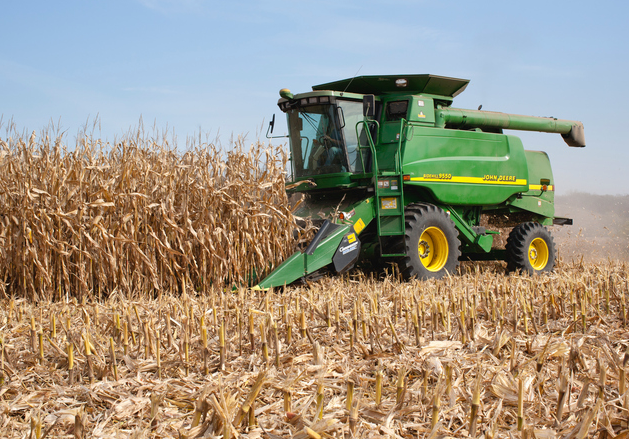 So in honor of your hard work, and in the interest of keeping you safe and productive during this busy time, here are some harvest-time suggestions and safety tips for your grain bins, dryers, and other equipment. Never enter a grain bin without doing the following first: De-energize (turn off) and disconnect, lockout and tag, or block off all mechanical, electrical, hydraulic and pneumatic equipment that presents a danger, particularly grain-moving equipment” (OSHA). Grain is not a stable surface, and when it’s moving, pockets can develop that will cause grain to act like quicksand. Never enter a grain bin without alerting others. Make sure the person inside the bin always has someone keeping tabs on them, as well as a safety harness or boatswains chair should they need assistance. Grain dust is very flammable, so be sure to regularly clean surfaces, filters, and other areas where excessive dust may accumulate. Be careful not to overfill bin with grain. Not only does this prevent ventilation, but it can put unnecessary stress on your structure. Plan regular inspections. Make sure chains and bearings are properly lubricated, ladders are secure, safety shields are present, etc. Getting the most out of your harvest requires evenly dried grain. Inefficient dryers increase grain waste with overdried and under-dried product. Be sure to view our grain drying page if you are looking to increase the efficiency of your drying, whether with an upgrade or a whole new system. If you are interested in viewing more safety tips, you can do so here. Meanwhile, if you are looking for more grain bin and grain dryer suggestions and tips, our partner GSI has a helpful page here. Additionally, be sure to get as much rest as you can during this busy season. When you’re out in the field, be sure to pack protein and calorie-rich food to keep your energy up and combat the tiredness such a hectic time of year often brings. We wish you a safe and successful harvest! As always, if you have any equipment questions throughout harvest let Gateway FS Construction Services know. With lots of grain system expertise, from grain drying to grain storage to grain handling and transfer, we have over 40 years of experience and are always happy to help. You can give us a call at 866-551-3454, and let our specialists help you find exactly what you are looking for. We look forward to providing you the best customer service experience. Some of our favorite projects at FS Construction Services involve the combination of practical application and customer imagination. It’s an exciting time when a customer has an idea for a custom building because we know it will test our creativity and ability to deliver a final product that matches and exceeds their unique vision. Such was the case recently when a customer wanted to double up on the usefulness of his new pole barn. His concept was to build a machine/vehicle storage shed that was also comfortable enough to function as a good old fashioned ‘man cave’. With his input, plus guidance and recommendations from our team of professionals, the final plans were a perfect combination of form, function and fun. We designed and constructed a 36’ x 48’ x 16’ Walters structure with a 12’ porch that wraps around three sides of the building. We worked with the customer to choose the right exterior, a color combination of dark grey wainscoting and light grey .28-gauge steel siding. Additionally, IECC-compliant Raynor overhead doors were installed. These rugged doors allow easy entrance for our customer’s camper, tractor, Bobcat, ATVs, and more, while also providing thermal insulation and preventing heat loss through the doors. The porch columns were constructed with a polypropylene material to eliminate structure deterioration and increase the building’s strength and longevity. Finally, lights and ceiling fans in the wrap-around porch completed our customer’s vision for comfort and hospitality. 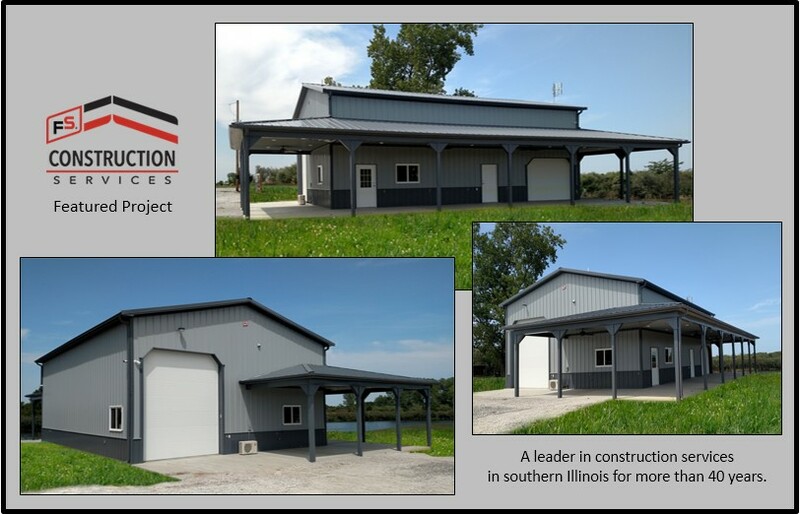 When the FS Construction Services crew completed the project, our satisfied customer had a finished pole barn structure that included a 16’ x 24’ kitchenette and recreational space plus a loft and bathroom that completed the finished product he had imagined. If there is a building project you have in mind, whether it is straightforward or requires some imagination, let Gateway FS Construction Services know. From wood to steel buildings, large or small, we do it all. You can give us a call at 866-551-3454, and let our specialists help you find exactly what you are looking for or check out our featured projects. We look forward to providing you the best customer service experience.